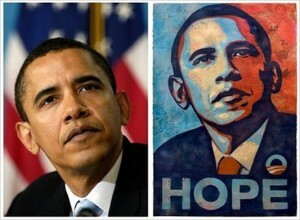 I was recently forwarded Peter Friedman's article titled, Fairey˙s Obama Hope poster copied nothing from Garcia˙s photo that could be copyrighted. Normally, the arguments in this case are whether Shepard Fairey's artistic rendering of the image is an infringement of a photograph by AP photographer, Manny Garcia. But in this case, Friedman argues that the image doesn't have enough "copyrightable elements" for it matter in the first place. Under copyright law, works are ineligible for copyright protection if they do not contain enough unique qualities that would differentiate them from others. For example, photos of coins are generally not copyrightable unless there are unique angles, uses of light, or other qualities of a "creative" nature. Friedman argues that, while Garcia's photo may contain some elements -- though he also argues they are minimal at best -- Fairey's artistic rendering virtually removes them: that Fairey's image has few, if any, copyrightable elements. His article states, "the poster entirely changes these details by transforming them into a stylized combination of red, white, and blue. Moreover, it is plain the colors of the photograph are in marked contrast to the colors of the poster." Friedman's logic concludes that if Fairey's photo has no copyrightable elements, then how can such a work infringe on any other work? While an intriguing question, one that I hadn't heard raised before, the artist in me has a hard time buying into the notion. Fairey's is a very identifiable style, one that Friedman himself applies to his own image, as shown here. Not only does Fairey's rendering enjoy its own protection under copyright, but the fact that it was derived from Garcia's photo means that Fairey's ability to use the work is limited. No one disputes that. Where the real argument begins is discerning the conditions where Fairey is limited, and where he's not. That is, unless he gains permission from Garcia, Fairey's use of his own rendering is limited to "editorial" uses, such as artistic display, political or social commentary, satire, and so on. On the other hand, "commercial uses" require Garcia's consent, such as when the image to advocate a product or service, or to promote an idea, including political or religious points of view. These are the types of uses that define "commercial use" as described by most state publicity laws. Granted, publicity laws and copyright laws are different, but the definition of terms are consistent. And herein lies the ultimate question: is the Fairey "Hope" poster a form of protected political speech, or a commercial use? As Friedman points out, political speech is at the heart of the First Amendment, and people's right to express themselves--especially on matters of politics--is always given deference by the courts. While a true statement, it's not quite that simple. Just because the Fairey image has been used in a political context does not necessarily imply that it's "political speech." And even if it is, the greater question is whether you can appropriate anyone -- or anything -- as a tool in that speech. For example, if the Fairey image were of a recognizable factory worker holding a hammer, and that person was an ardent Republican, we can be very sure that this person would sue Fairey for suggesting that he was an advocate for Obama. And the courts would not even begin to entertain the notion that this use of the image was "protected political speech." The First Amendment has its limitations, and this is such an example. Although "property" (such as a copyrighted photograph) does not enjoy the same protections as people's rights of publicity, the point of the example was more to illustrate that the use in question is would fail a critical Fair Use test: it's an advocacy piece, and when advocating a political idea, you cannot misappropriate someone's likeness or their property without their consent. The ideas, opinions and expressions have to be yours, and yours alone. You have the right to express an opinion about someone in a political context, but misappropriating their property (or someone else's) for that purpose is not the same thing. What if Fairey applied his artistic rendering technique to the Pepsi logo and added the phrase, "Obama's Generation." One can imagine that Pepsi would not take so kindly to having their logo misappropriated in such a manner. Now, if Fairey's work were merely a piece of art hanging in a museum or an art gallery, courts have deemed this as Fair Use, regardless of the price that it may command, or even whether he copied it directly from Garcia's photo. ("Commercial" use is not not measured solely by monetary consideration.) Yes, one can appropriate another work, a person, or a logo without their consent, for purposes of artistic expression. But which is the Fairey image? Protected art form? Or an advocacy poster? We have competing notions, but which carries more weight? To reconcile this logjam, courts often take into account is the predominant use? Is it used more as an art form? Or as a form of advocacy? Or is Fairey just out to make a buck?